Tagasaste flowers prolifically, producing an abundance of seed in little furry black pods. Flowering can be sporadic but generally starts from June till October in Winter rainfall areas. In subtropical to tropical areas, Tagasaste can flower throughout the year, depending on specific conditions. For this reason, Tagasaste is widely used for bee fodder. The seed is very hard and needs to be treated in order to make it germinate successfully. Seed can be stored for up to three years, but it does lose viability as it ages. Tagasaste is a legume, therefore an inoculant should be used to help the roots fix nitrogen into the soil; this can be done at, or after, planting. 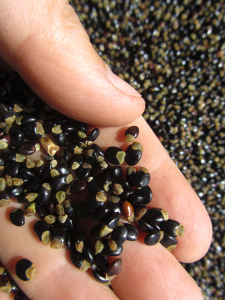 Tagasaste seeds are quite small, so we sell our seed by weight, not by number. There are approximately 42 000 seeds in a kilogram. All our seed is handpicked from the tree at just the right time, then dried, threshed, winnowed and finally stored. We pick fresh seed every year to ensure our customers get only the best. It is then sent straight to you via registered mail, or by courier on request. *Seed and seedlings can be collected by appointment. View Media on Damara Farm here.